Rockstar will be dealing with Max Payne 3 cheaters in an interesting way - they will be "quarantined" and only able to play against other cheaters. 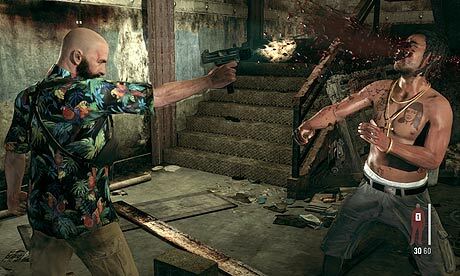 Anyone found to have used hacked saves, modded games, or other exploits to gain an unfair advantage in Max Payne 3 Multiplayer, or to circumvent the leaderboards will be quarantined from all other players into a "Cheaters Pool", where they'll only be able to compete in multiplayer matches with other confirmed miscreants. In the event we decide to absolve any of these cheaters for their past transgressions they may re-enter play with the general public, however a second offense will result in their indefinite banishment. That's extremely smart, good job. I agree with the above comments. Good job. Keep all of the rats in the same cage. Too bad at any given time only about 2,000-10,000 people max are playing(at least going by the in game stats). I dont see this one being a long living MP title. Although its pretty fun. I wish others would follow suit; granted, May Payne 3 doesn't have a massive multiplayer community...but imagine what the effects of a system like this would have on something like a Halo or Call of Duty game. Why is this even an issue? Don't trust the client, and keep all the multiplayer data on a server. If you're having problems with multiplayer cheating because they're hacking client-side saves, you're doing it wrong. Yeah I don't quite understand the reasoning behind storing multiplayer user data in local save files so the user can modify them, tsk tsk. Because companies don't want to expend oodles of dollars building up an infrastructure and oodles more hiring people to create then maintain that infrastructure? And then get blasted when they decomm that service. There is NO business justification with this MP population (even in the most optimistic sense) spending that kind of capital. Unless they raise the price of every box by $1, then they can afford the devs (both server and tools), admins, server hardware (or VMs, depending on if a VM can handle the loads), rack space, power, network hardware, and so on. A CoD that is heavy on MP? That may be a different story. The reality is that maintaining that data on a single company server requires a lot less resources than you think. Ask yourself how many millions of dollars and thousands of man-hours Evil Avatar requires to maintain his database for this forum. Running game servers for a big population is pretty expensive. Maintaining player stats for that same population is trivial. It'd be great if Rock Star devs trilled about this "prison" with god-mode enabled. ^Correction: trolled. Damn spell check! That would be epic. Them just running around killing everything in sight, breaking every man's will and showing them that cheating isn't fun. Evil Avatar doesn't have millions of users, text is cheap to store as a memo field and this site doesn't have to hold up to "professional" up-time standards (though I've rarely run into a time when the site was down). Plus who knows the data structure involved in a saved game? It could be megabytes in size for each player. That takes a long time to transfer and a lot of storage space. You can't just sit a Dell XPS under some intern's desk and call it a day. Like it or not hosting costs money (probably in multiple datacenters to serve a world-wide audience), engineering the system takes money, creating the admin tools takes money. Detecting when someone has tampered with files is easy and cheap. I was going to point out all the mistakes in your assumptions, but that would be a mess because every single one is wrong. I used to write custom database software like that, back before modern DB tools made it cheaper and simpler. Tell me where hosting is free for an enterprise level application that has to scale to, potentially millions of users and manage potentially gigabytes of data. Oh yeah, and free developer time. We'll just create that out of thin air. When you were custom creating databases you were working for free, right? No, you were probably really expensive, am I right? Therefore my point still stands, it is too expensive for most companies/products to invest in infrastructure and systems just to preclude cheaters. There is no business case.